Please call or email us to order this AllDolly. 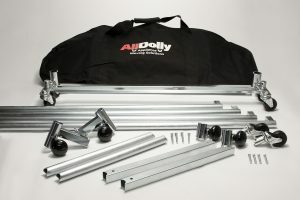 Need more height for appliances over counter height, the Tall AllDolly is just the thing and like all the others works well for the traveling appliance repair trainer or urban repair technician that has minimal space to spare in your vehicle by adding the optional Storage Bag or Carry Case. NEW! The Updated Tall Standard AllDolly has a fixed width of 31″ and a range of height from 6 1/2″ to 44″ (depending on how you assemble the support beams). It can be used for the removal, support, repair and re-installation of most built in appliances, particularly Ovens, and can be used to service most other appliances too. With the Accessory shelf it can be used as an adjustable height work table which can be easily fold and stored against a wall or hung up on hooks. Or add the optional Storage Bag or Carry Case for added protection and smaller / denser storage. Support beams adjust from approx. 6 1/2″ to 44″. Folds to 34″ W x 48″ high x 2″ thick, for storage (similar to a folding table) and transportation. First this dolly is great, it is easy to use (once it is put together) and is a must for a one man show. The break down is great for a small truck or car but I wish they had the size broken down on the website. Also it is a pain to breakdown because the lower joints are not ‘quick connect’ like the upper ones are. You need a space on the ground about 48"x36" to put it together, not all homes can accommodate that type of floor space-I have to put it together in the street or parking lot most times I use it. Overall it is great because it is the only oven/dryer dolly that (when broken down) fits in my small Ford Transit Connect. Excellent tool to eliminate second man calls. But unit needs to have quick disconnects throughout to reduce assembly time. Great products. I ordered a tall oven dolly and a little dolly for tilting washers forward. My initial impression was that they are well built, very sturdy, and will hold up to years of use in the back of my van. I plan on using the oven dolly to replace a Whirlpool oven TOD that went out when my customer was self cleaning their oven last week. I used to have to have a second guy with me to pull the oven out. I think this will eliminate that need. I ordered the dolly on a Thursday night, it shipped on Friday and it got from California to Utah on Tuesday. Fast shipping. Company was very responsive when I requested a tracking number for my orders. I would definitely work with them again.